What does a Fitter do? 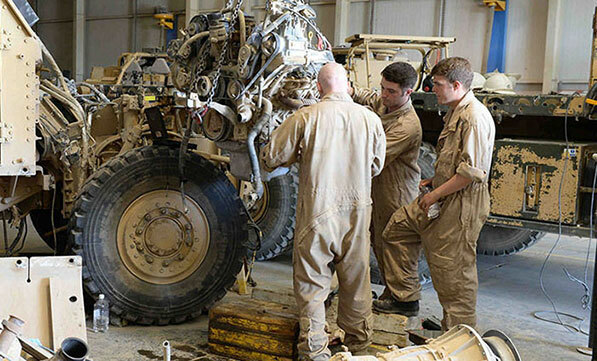 In the Army, you service nearly all our vehicles and equipment. That means you could be sent anywhere in the world. First-class training teaches you about construction methods, health and safety, and working from engineers’ drawings. You become an expert in bench fitting, fabrication for petrol and diesel engines, mobile generators, transmissions and hydraulic systems. Plus, you can get qualifications and build skills for your future career. On top of all that, you’ll have an active Army life, full of sports, adventure and friends. Then it’s off to the Royal School of Military Engineering Regiment near Camberley for nine weeks. Here, you learn military engineering skills such as knots and lashings, demolition, mine warfare and bridge building. You’ll get your driving licence too, if you don’t have this already. Finally, you go the Royal School of Military Engineering in Chatham for 41 weeks. Here, you learn about petrol and diesel engines, generators and pumps. Earn £15,230 during training. When your Initial training is finished, and you join your unit as a Sapper, your pay will rise to £18,859.